Dinner my second and last meal of the day. 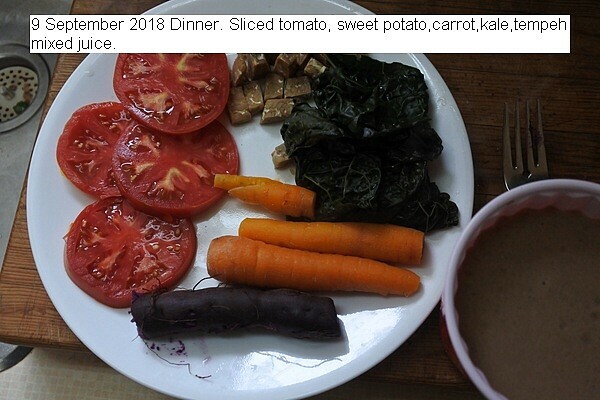 Sliced tomato from the garden, few leaves of kale, a couple of carrots, both steamed. Some cut up tempeh. Small sweet potato tuber previously baked. A glass of mixed juice. Only garnish was butter and a bit of vinegar on the kale. Even shared with my dog. This entry was posted in Uncategorized and tagged 9 September 2018 Dinner, Dinner. Bookmark the permalink.